The follow-up to Furdemption challenges players to help King Rabbit rescue bunnies which have been captured by evil creatures. RareSloth has announced the launch of King Rabbit on iOS. The sequel to Furdemption challenges players to help King Rabbit rescue bunnies which have been captured by evil creatures. In each level, players swipe on the screen to move King Rabbit around the environment. Players can push crates, stand on switches and more to manipulate the world, with the goal of reaching a trapped bunny somewhere in the level. While the main goal of each stage is to rescue the trapped bunny, players can also collect three gold coins in each level. As players collect coins in bulk, they’ll receive Diamonds, the game’s premium currency, which can be spent on different death animations for King Rabbit, and on ‘slow time’ power-ups. These power-ups slow the movement of all items in a level except for King Rabbit. Levels are filled with obstacles like turrets, saw blades and spikes, as examples, and some stages allow players to move some of these objects to clear a path or reveal gold coins. A hint system allows players to spend real money on hints, which provide step-by-step solutions for clearing stages. 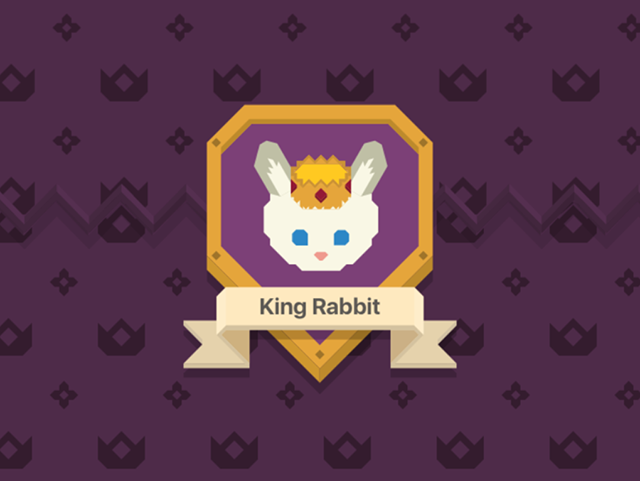 It’s been amazing to have so many fresh players on King Rabbit—they are breathing new life into the community! Our fan base has been steadily growing, and we’re excited to bring joy to so many people. King Rabbit is available to download for $0.99 on the iTunes App Store.